We provide a certified translation, ready for submission to USCIS, employer, any US college / university, WES, ECFMG, USMLE, FPGEE, IERF. Translations are accompanied with Certificate of Translation. 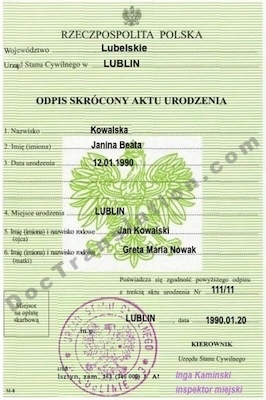 We also provide Notarized Polish Translation as option (additional product you may add to your cart). 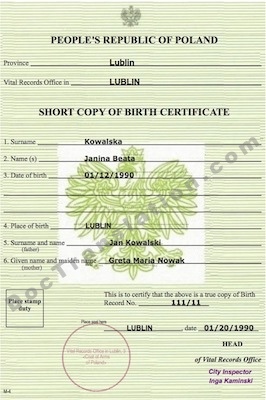 Most organizations like USCIS, universities, colleges, require certified translation, but in some cases, for example, while filling polish documents to courts, translations must be notarized. We recommend you clarify the translation requirements of receiving authority. Our translation agency based in New York, but we provide certified polish translation services all over the USA, including Greater New York (Brooklyn, Greenpoint, Rochester, Williamsburg, Maspeth, Ridgewood, Syracuse, Riverhead, Buffalo, Long Island), Illinois (Chicago), Michigan (Detroit, Poletown, Wyandotte, Hamtramck), Pennsylvania (Luzerne County, Wilkes-Barre, Pittston, Hazelton, and Nanticoke), New Jersey (Linden, Wallington, Bayonne, Clifton, Garfield), Wisconsin (Milwaukee, Lincoln Village), California (Los Angeles, San Francisco), Ohio (Columbus, Cleveland, Garfield Heights, Parma, Seven Hills, Brecksville, Independence and Broadview Heights), Florida (Miami), Massachusetts, Connecticut (New Britan), Minnesota, Texas, Maryland, Indiana, Arizona, Virginia, Colorado, Missouri, Georgia, Boston, Baltimore, Oregon (Portland).